Use the EN-45059 meter in order to tighten the outer tie rod nut to the specification. Use paint in order to place match marks on the steering linkage inner tie rod nut and on the steering linkage inner tie rod. During installation, align the match marks. Do not tighten the nut during installation. Tighten the nut after adjusting the front toe. Refer to Wheel Alignment - Steering Wheel Angle and/or Front Toe Adjustment. Do not free the ball stud by using a pickle fork or a wedge-type tool. Damage to the seal or bushing may result. Use the CH-161-B puller in order to separate the steering linkage outer tie rod from the steering knuckle. 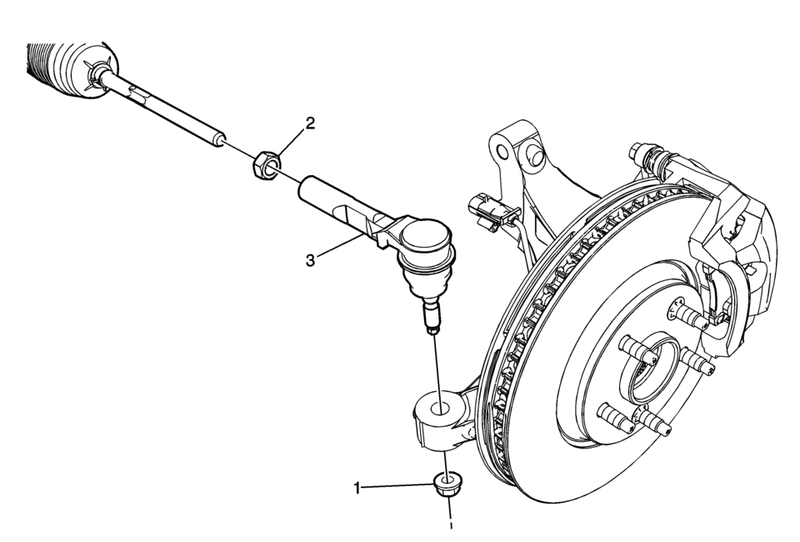 Inspect the steering linkage inner tie rod for bent or damaged threads. Clean the tapered surface of the steering knuckle. After the installation is complete, measure and adjust the front toe. Refer to Wheel Alignment - Steering Wheel Angle and/or Front Toe Adjustment.